The story opens as a dad reads ‘Beowulf, the Brave’ as a bedtime story to his son. 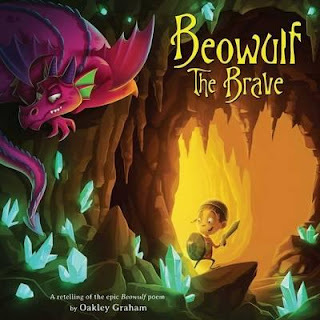 Beowulf, the Brave is a re-telling of the longest poem in Old English and reminiscent of the story, David and Goliath; stories where good defeats evil. The original story of Beowulf is set in the 6th Century in Scandinavia. In this retelling, there is a little boy who is Beowulf (who, in the illustrations, looks identical to the son listening to the story) He saves his community from a monster, with the monster’s mother followed by a dragon. His brave accomplishments are remembered through the words in a song. The exaggerated facial features, along with dramatic body language and bold colours, add to the energy that flows through this book. Children from preschool up will enjoy the story’s liveliness and the boy’s get-up-and-go attitude. The words 'Your battles with monsters are legendary, Remembered in song to make us merry' is repeated four times, and children could be encouraged to chant these words along with the reader.